It officially feels like spring in Boston but I can’t wait for allergy season to pass so I can enjoy the outdoors without itchy eyes, sneezing fits and a runny nose. This floral petal sleeve tee is so gorgeous that even my mom asked for it last week when I was shopping for her Mother’s Day present. It runs true to size since I took my usual size XXS regular but the arm holes and shoulders may be snug for some. 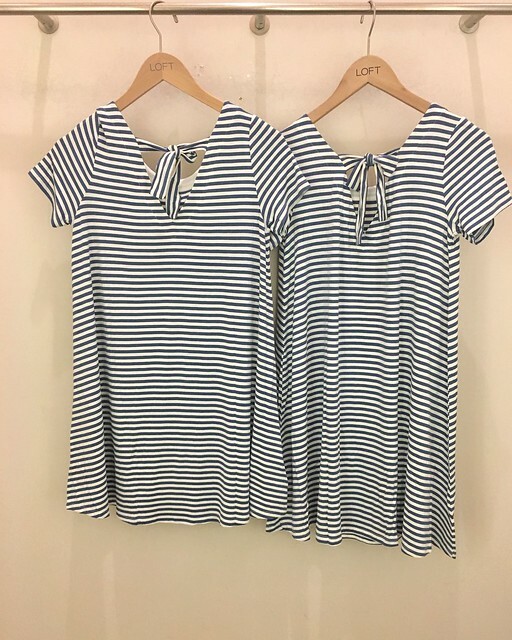 I also ordered the striped version but the arm holes for the one I received were too snug (cutting into my armpits) and it fit a bit smaller and shorter than the floral print. Note that I review the striped version in size SP below. I ordered this new cargo jacket in size XXSP to try and it runs one size bigger. Size XXSP fit like size XSP. Refer to this clip for another view of the fit on me as well as the color. I would describe the the color as a salmon pink which isn’t the shade I was looking for so I’ll be returning. (This new bomber jacket may be a slightly different shade of pink if you’re looking for another option.) I tried on the jacket for this one photo before my husband agreed that it had to go. The material is slightly sheer so you can see patterned tops through it. It’s a light jacket that offers no warmth making it more cute than functional. The pockets are functional. I would have also preferred if the hardware was a brushed/light gold instead of brushed silver. 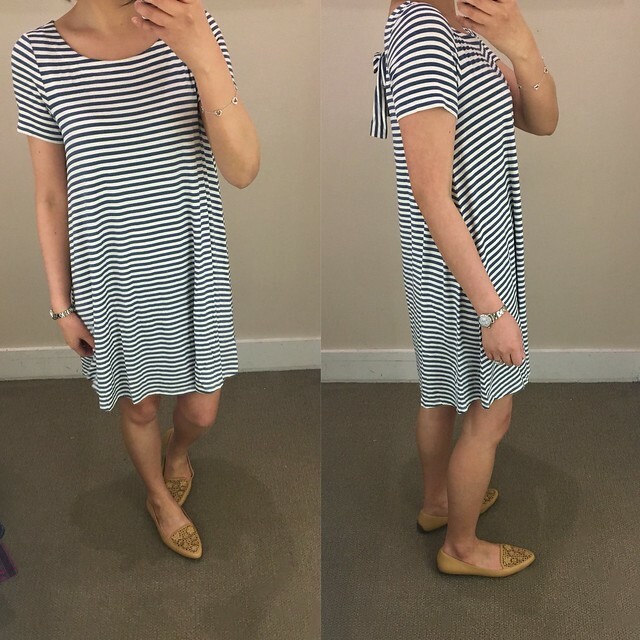 I have and love this striped dress from last year (last seen here) in off-white with black stripes so of course I snagged this dress in navy with white stripes when it was free ship and $39.50. 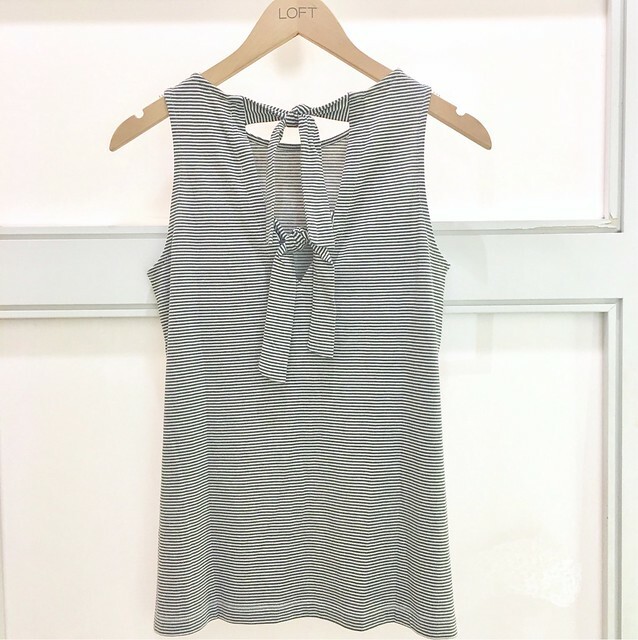 It’s a versatile summer dress that washes well and you can dress it up or down with the right shoes and accessories. 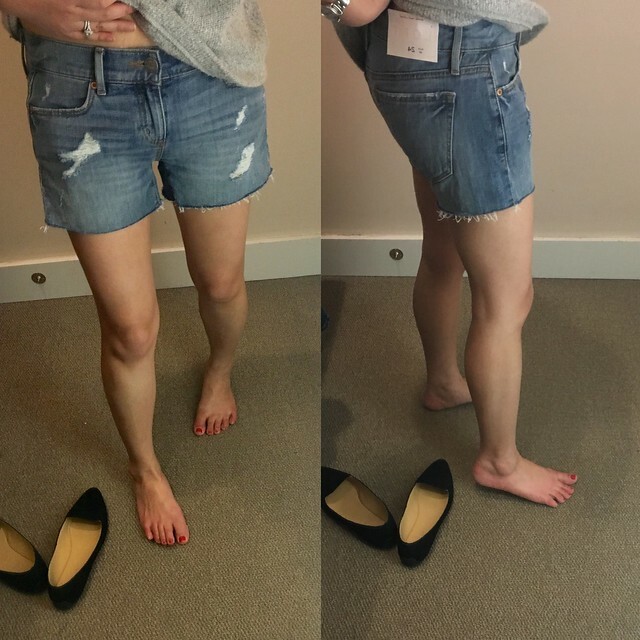 It runs true to size compared to my usual size XXS at LOFT but I’m not very familiar with J.Crew Factory sizing. If you’re interested in the rattan clutch refer to this clip I saved from my Instagram story. 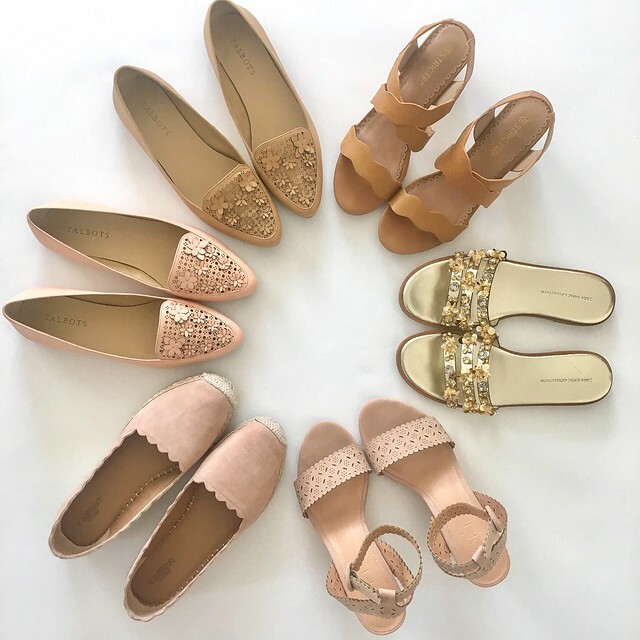 I wore out my Zara gold beaded sandals tonight and my feet always expand in the heat so I ended up with a blister on my right foot since it’s the wider of my two feet. I will reorder it in size 7 1/2 so see if the length fits my foot any better. I ordered it in size 6 1/2 but the length is a bit too short for my foot enough to bother me. Refer to this clip to see what the sandals look like on. 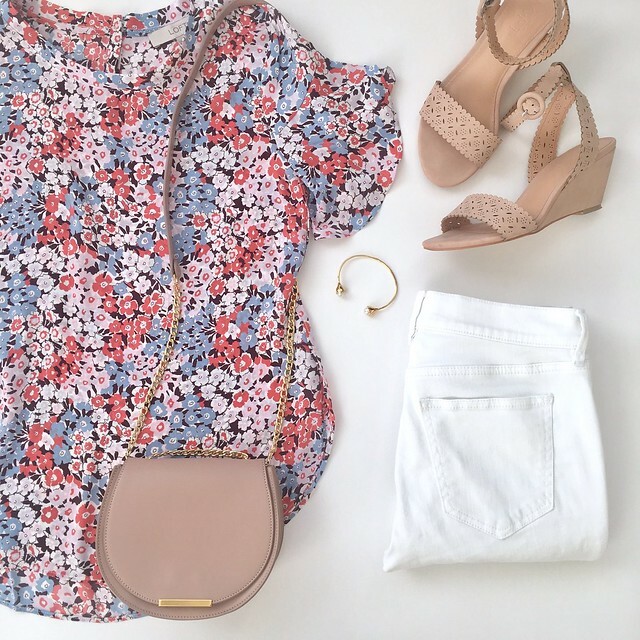 Get select summer styles starting at $10 and an extra 40% off sale styles at LOFT. The little embroidered details are so lovely on this swing dress. Size XS regular fit me okay but I would prefer size XXS for the best fit. The regular missy size is a good length hitting right above my knees. Refer to this clip for another view of the fit on me. The dress is fully lined so it is not see through and the vneck is not too low for once. I ordered this clean tee after seeing it on an associate at my local store last weekend. I ordered XXS regular but I won’t receive my package until Tuesday. 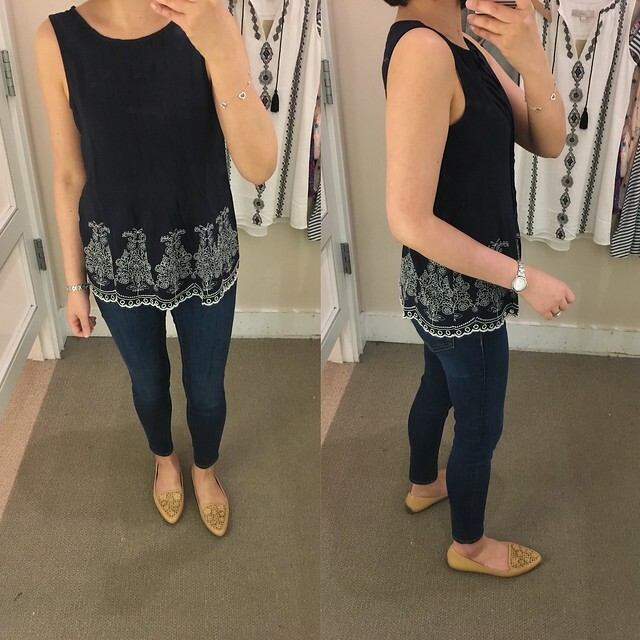 I found size XSP to try on in store tonight and it has a loose but flowy fit. It fits true to size so XXS regular should fit similar to XSP except it’s slightly longer in the overall length. The shoulders and chest run narrow so you may want to size up for more comfort. Refer to this clip for another view of the fit on me. The polyester material isn’t sheer at all so I didn’t find it to be see through. I was wearing a dress today so I grabbed these dark rinse jeans to try in my usual size at LOFT but they felt snug so I would recommend going up a size for a more comfortable fit. 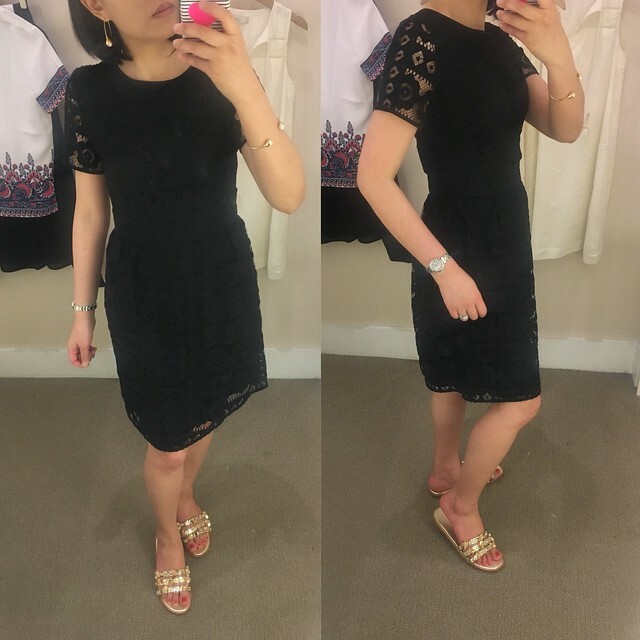 I saw this lace dress in my store’s online only section. I love the pretty floral lace and it fits true to size. I’m not sure if it came in petites but regular 00 was a good modest length (note: I’m 5′ 2 1/2″). 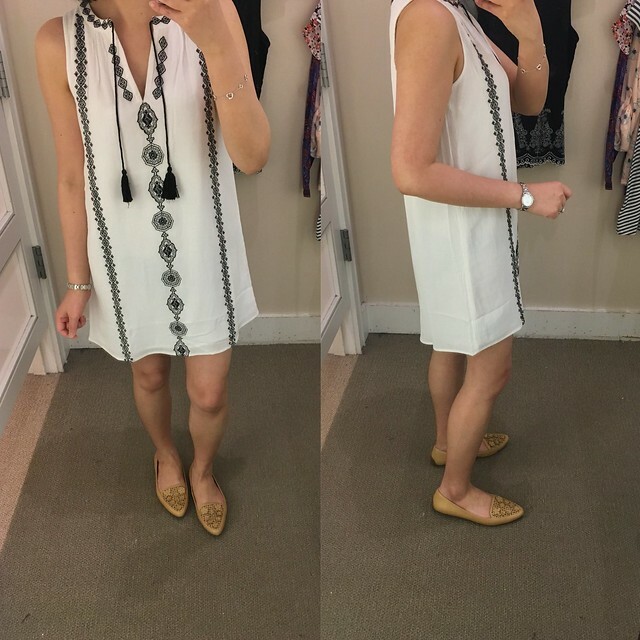 I tried on this new arrival last week when I was looking for the dot embroidered tassel swing dress reviewed above. It’s note yet available to purchase but it should be online soon likely after this latest sale. It runs big since size XXSP fits like size XSP but the overall length is shorter than I prefer. I would prefer this dress in my usual size XXS regular for extra length and best overall fit. The black embroidered against the white really pops. I’ve been looking for this striped bow back shell and I was excited to find it in size XXSP in store last weekend. It runs one size bigger so I sized down to XXSP which fits like XSP. 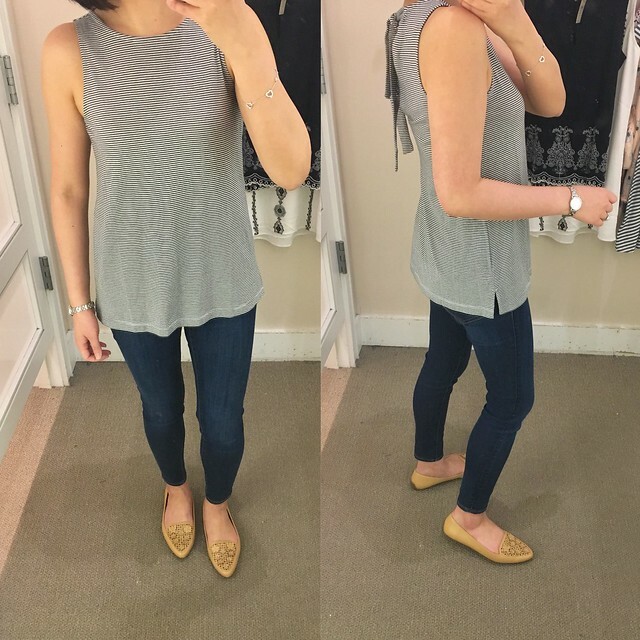 I had tried on size XS regular in this post which was really long and loose on me. How sweet are the double bows on the back? Refer to this clip for another view of the back of this adorable top. 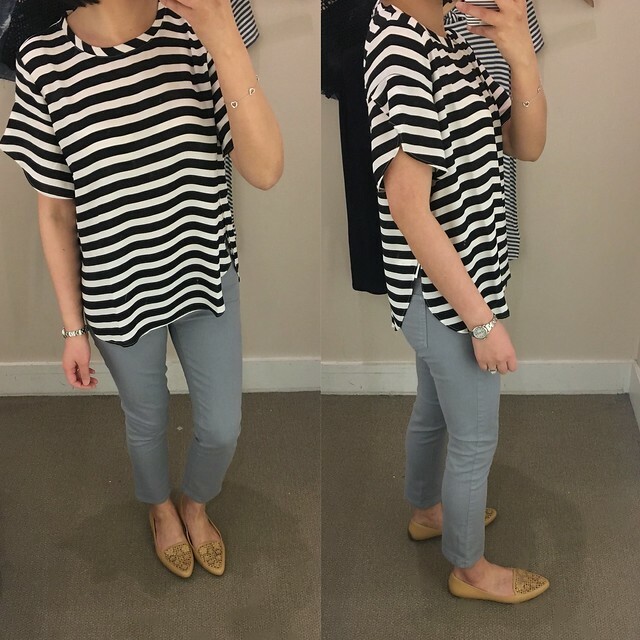 As I mentioned at the beginning of this post, I ordered this striped petal sleeve tee in size XXS regular but I received a defective one that fit nothing like the floral version. 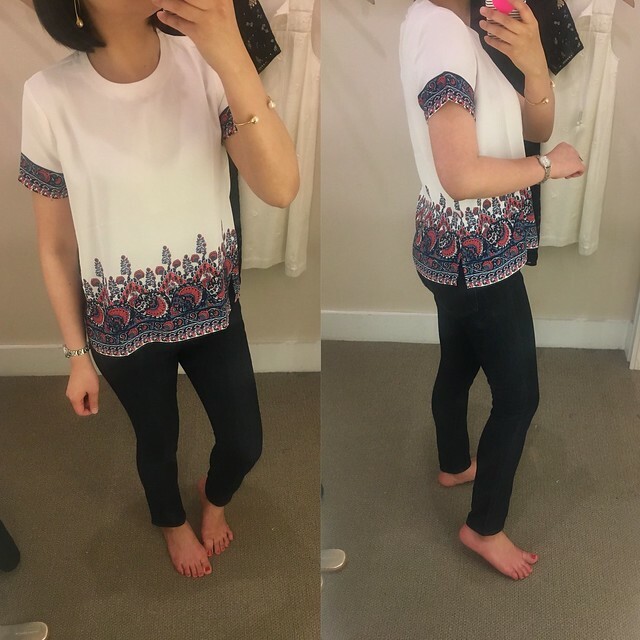 Last week I was eager to assess the fit of this top and I tried on size SP which was too loose and wide on me. You can see the shoulder seams are coming off my shoulders in the left picture below. The slit of the shirttail hem also comes up a bit higher in petites as you can see from the side view here. The windblown grey jeans pictured above fit true to size and they’re a good ankle length on petites if you unroll them. 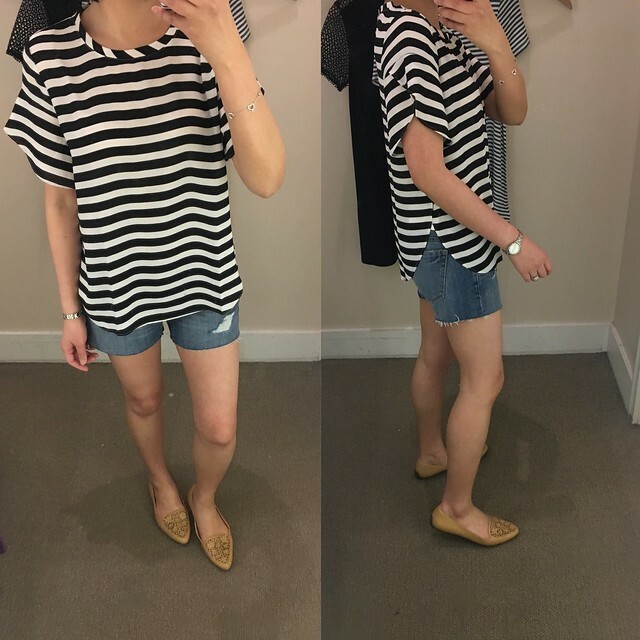 Last year I got the dark version of the cut off shorts (review here, last seen here) and I’m loving the lighter distressed wash this year. I took size 24/00 regular which fits like my usual size 25/0P at LOFT. I have smaller thighs so I like that the leg openings are not too wide on me. This dress had me at the stripes and adorable bow detail in the back. 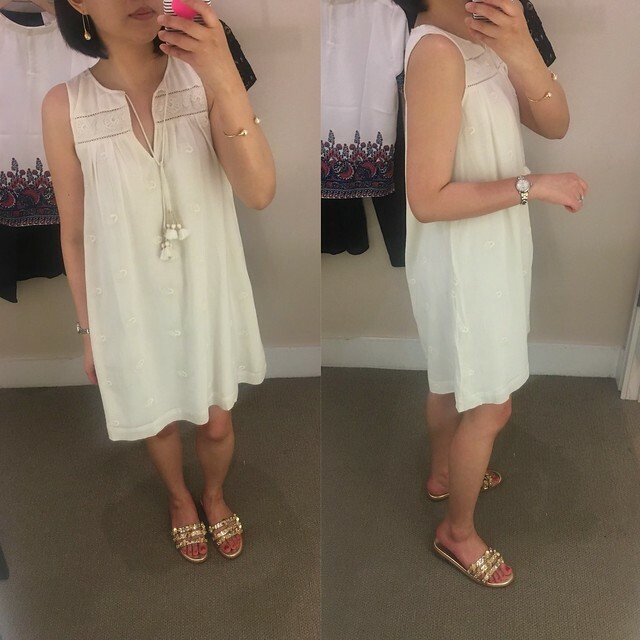 It’s a light dress perfect for the spring and summer but the length is short in petites so I tried on size XS regular for a longer overall length. Refer to this clip for another view of size XS regular on me. 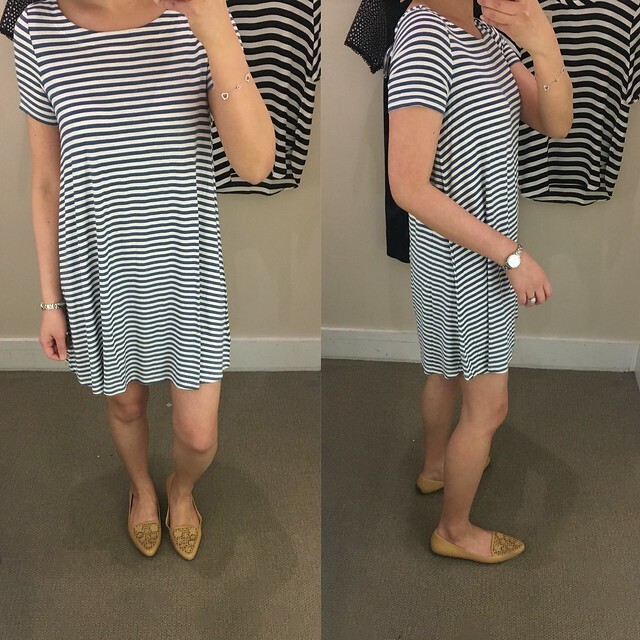 I ordered this dress in size XXSP before I had a chance to try on this dress and I received it last week. Strangely enough, I found that the length of size XXSP was longer than size XSP but I don’t know if it is a fluke or poor execution on LOFT’s part. I ended up keeping size XS regular for the longer length. The white embroidered detail of this shell is so pretty and I found that it fits one size bigger. Size XXSP fit like size XSP. This dress is so soft and flattering. 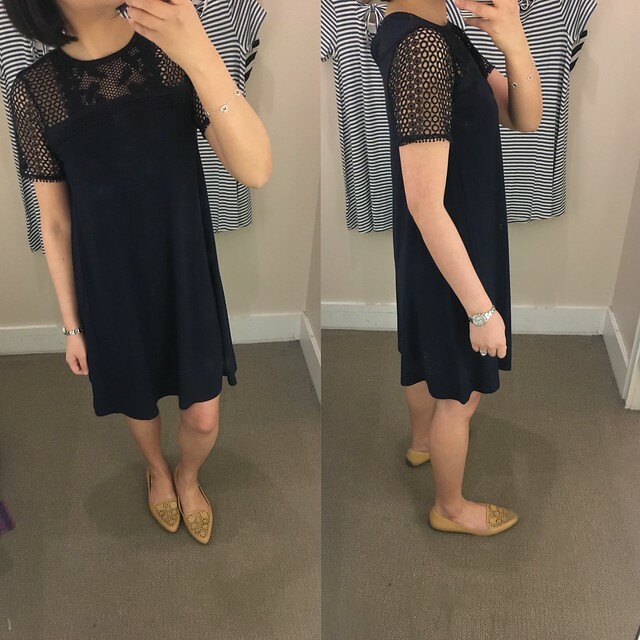 I found that it fits true to size and I love the pretty lace details. The petite length hits me right above the knees. 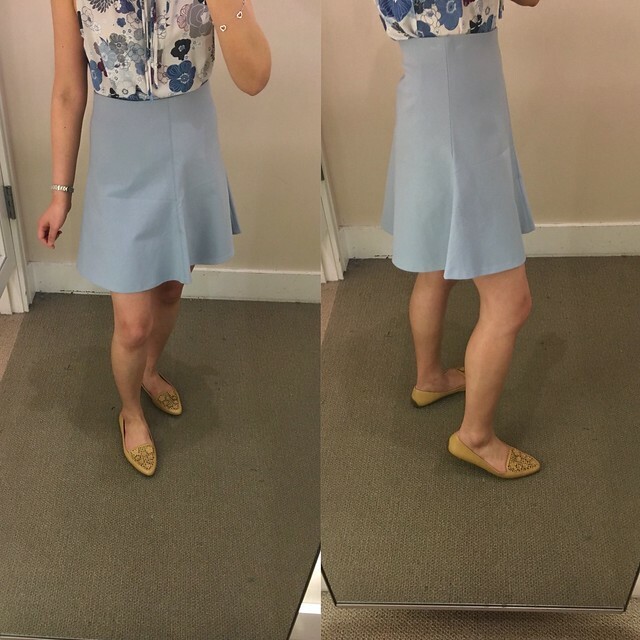 Lastly, I tried on this flippy skirt that Su @allaboutloft‘s requested since she was interested in this exact pairing with the floral shell. The skirt fits true to size in my usual size XXS regular and the material has a good weight to it. The next size up was much too loose and wide on me. Refer to this clip for another view of the fit on me. I wore the skirt higher on my waist to get the same look as their online stock image/model.